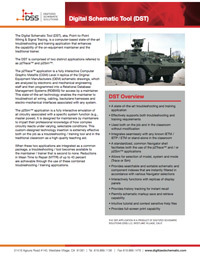 The Digital Schematic Tool (DST), aka, Point-to-Point Wiring & Signal Tracing, is a computer-based state-of-the-art troubleshooting and training application that enhances the capability of the on-equipment maintainer and the traditional trainer. The DST is comprised of two distinct applications referred to as p2Trace™ and p2Sim™. 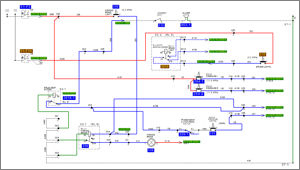 The p2Trace™ application is a fully interactive Computer Graphic Metafile (CGM) Level 4 replica of the Original Equipment Manufacturers (OEM) schematic drawings, which are analyzed by electronic and mechanical engineering staff and then programmed into a Relational Database Management Systems (RDBMS) for access by a maintainer. This state-of-the-art technology enables the maintainer to troubleshoot all wiring, cabling, backplane harnesses and electro-mechanical interfaces associated with any electrical, hydraulic, pneumatic or fluid flow system. The p2Sim™ application is a fully interactive emulation of all circuitry associated with a specific system function (e.g., master power). It is designed for maintainers by maintainers to impart their professional knowledge of how complex circuitry reacts under varying, selectable conditions. This custom-designed technology insertion is extremely effective both on the job as a troubleshooting / training tool and in the traditional classroom as a high-quality teaching aid. p2Sim™p2Sim™ is a visual application designed and developed specifically for equipment maintainers and training staff. The application is designed for maintainers and trainers by maintainers and trainers who possess extensive practical industry experience to convey precise, effective troubleshooting and repair information of complex electrical, hydraulic, pneumatic and fluid flow systems. p2Sim™ is especially useful to the maintainer who is working with equipment that requires reference to and analysis of large volumes of cumbersome, complicated wiring or piping diagrams. It is equally useful to the on-the-job trainer or instructor in the traditional classroom environment. p2Trace™ is an integral part of the Digitized Schematic Solutions LLC, Digital Schematic Tool (DST) application. Troubleshooting is one of the major problems facing the technician / maintainer in effectively performing maintenance on most electronic systems. Most every technician / maintainer has seen a “perfectly good component” appear to malfunction because of a bad cable connector or backplane wiring harness. If determined to be the result of defective wiring, finding the specific failure can often require hours of researching technical data, which more often than not is located in one or more technical manuals. p2Trace™ reduces research time from hours to seconds by systematically eliminating wire tracing problems and providing the user with an interactive, automated map of every signal in the system, from its origin to its termination. This interactive map is pre-colorized to depict signal, ground and power. This colorization feature enhances learning by differentiating the various traces by a specific color.